Kanomax FMT’s Drift Tube Ion Mobility Spectrometer (DTIMS) provides ultrafast-response and highly resolved power size distribution measurements for large molecules and particles from sub-2 to 40 nm. Drift Tube Ion Mobility Classifier Model 3670 (DTIMC) to size-select the particles. 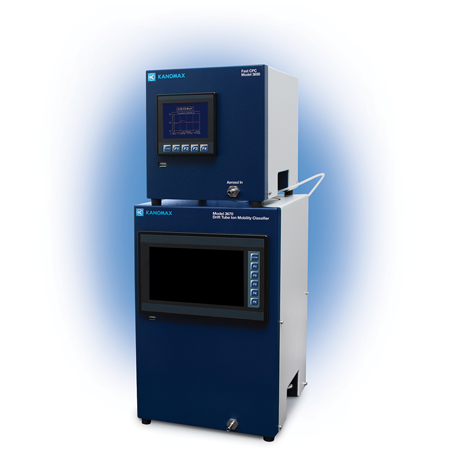 Fast Condensation Particle Counter Model 3650 (FastCPC) to count the particles. The unique aspirating drift tube design of the ion mobility classifier allows the DTIMC to classify a defined “sample volume” of aerosol particles based on temporal separation of mobility. This significantly shortens the measurement time as compared to the time needed for conventional spatial-separation classifiers, such as the Differential Mobility Analyzers (DMA). By coupling the DTIMC (Model 3670) with the FastCPC (Model 3650) with a response time constant < 20 msec, the DTIMS provides best in class size distribution measurements that are as fast as < 10 sec for sub-10 nm, and 60s for < 40 nm particles.